Looking for a way to make that baby shower extra special and memorable? Whether you are hosting the baby shower at home or at an extravagant venue baby shower centerpieces will make your shower a big hit. Traditional baby shower centerpiece ideas often revolve around floral arrangements and balloons. While those traditional centerpieces are still popular, more and more hostesses choose to decorate with diaper cakes. Diaper cakes not only make stunning baby shower centerpieces but unlike floral centerpieces they are also very practical, eco friendly and loaded with useful baby products for the parents to be. While a big portion of baby shower hostesses choose to purchase their baby shower centerpieces a lot choose to create their own as it shows their love and support to the mom-to-be. Making a Diaper Cake is fairly not difficult and with a little patience and effort you can make one in no time. But if you are just not that handy or crafty to make your own from scratch but still want to make it special and show your support for the new mom then a do-it-yourself diaper cake is just what you need. 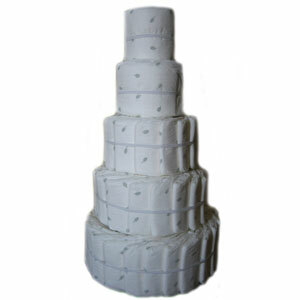 Our Eco Friendly undecorated Do-It-Yourself Diaper Cakes are a perfect opportunity for your imagination. You can customize your diaper cake to match your baby shower theme, use your own creativity and design a truly unique gift for an expecting parent. Add your own baby toys, ribbon, flowers, baby items and make this blank pallet a masterpiece. Let your imagination run wild, and be the talk of the party when you say “I’ve made this cake myself!”. That is true. Baby diaper centerpieces are the way to go. Good information. The diaper cake is just adorable. I have never seen such a selection of diaper cakes. They are definitely cute and very practical. The diapers can be used later when the baby is born. It looks good enough to eat…but a lot less messy!! !